Disclaimer: This blog makes use of sponsored and/or affiliate links. Please see this page for more information. 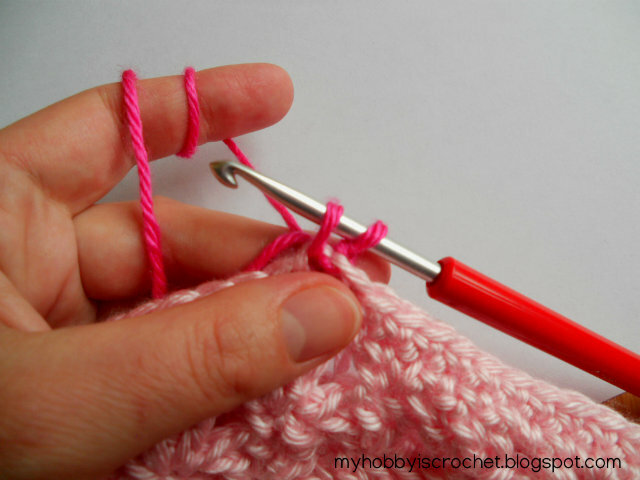 Love the look of the crab stitch, but hate working in the wrong/reverse direction? There is a solution! 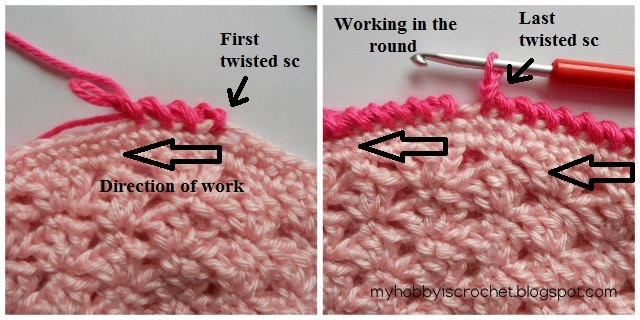 The Twisted Single Crochet! The twisted single crochet it is a crochet stitch that i learned watching a video file on the Japanese site Gosyo. 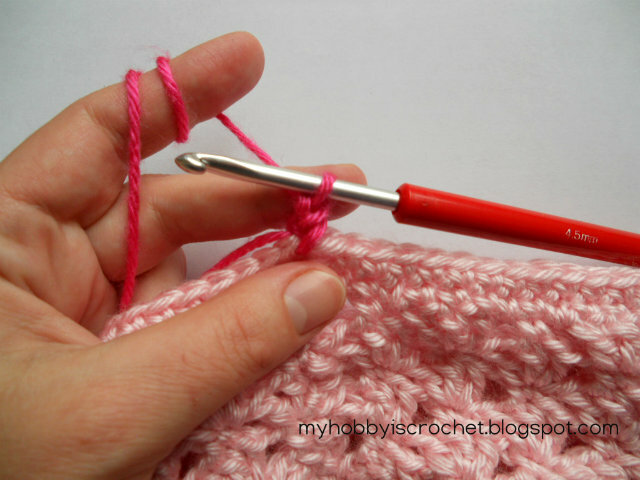 Do not be confounded with the crab stitch/reverse single crochet! There are 2 different stitches! 1) Insert the hook from front to back in the next stitch to the left! To see the pictures bigger, all you have to do is click on them. 3) Leaving the 2 loops on the hook loosely, rotate the hook anticlockwise 360 degrees. 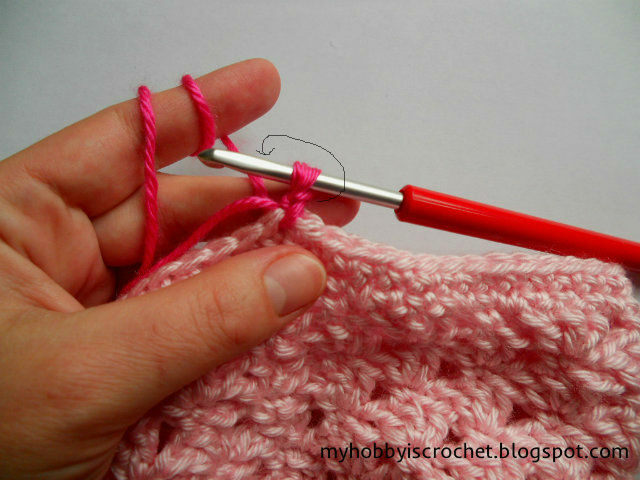 4) Yarn over and draw through the 2 loops on the hook. The first tw sc it now complete. Repeat the steps 1-4 for each stitch across the round/row. Try to work the stitches even, having the same tension for each stitch. It takes a little practice, but after a while you will get the hang of it and make a nice crochet border. I hope you enjoyed this tutorial! For more free crochet patterns and tutorial, please visit my FREECrochet Pattern Page! Don't miss out new free crochet patterns, tutorials and other updates from My Hobby is Crochet! 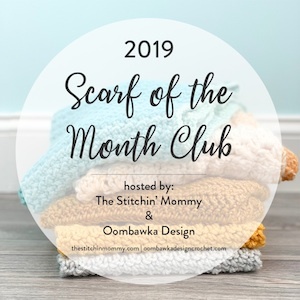 Subscribe to our FREE Newsletter and follow My Hobby is Crochet on Facebook, Pinterest, Twitter, Google+ and Instagram. I wanted to watch the video but it was not working..this seems neat..I will have to give it a go sometime..would give a flatter look to a row that is the last one..boarder I guess you could say. The video opens as a download on your pc. You have to wait a little, than look in your downloads files. Hope this will help. Shop Amazon? Support My Hobby is Crochet to bring you more free crochet patterns! © 2013 - 2019 My Hobby is Crochet. Powered by Blogger.